You log into the system to find a warning in a browsing saying that your data is encrypted? The BTCWare-PayDay ransomware is one of those threats that welcomes you in this way in an attempt to obtain your money. Your data is taken hostage for a ransom which is not specified in the warning, and the longer you wait, the bigger the price grows. However, we strongly advise you against paying up because there is no guarantee that some crooks behind the BTCWare-PayDay ransomware will ever bother to restore your data. All that you should do now is remove the BTCWare-PayDay threat from the computer and make sure that this is not going to happen again in the near future? How is that possible? We provide some preventative measures, so if you are interested in this threat and how to avoid it, we invite you to continue reading the review. The BTCWare-PayDay ransomware is installed surreptitiously like any other malicious threats. Once launched, it encrypts files and alters their file names by adding a new extension, which consists of an email address and additional text. The email address may vary from extension to extension. For example, users of affected computers may find extensions such as . [aversia@tuta.io]-id-0.payday, .[support@fbamasters.com]-id-0.payday, . [payday@cryptmaster.info]-id-140.payday, to mention just a few. 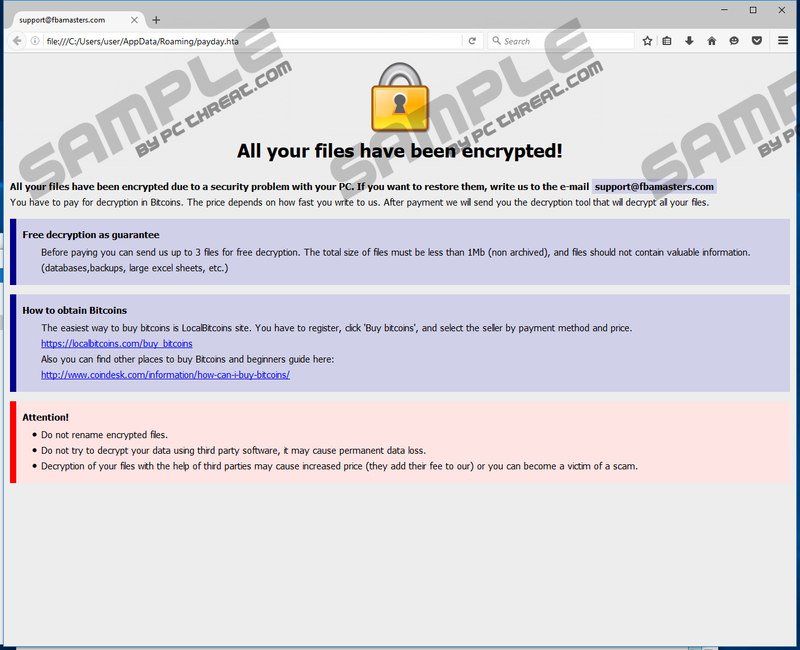 It is assumed that the BTCWare-PayDay ransomware is another variant of the strain of ransomware named BTCWare, which spreads by exploiting weak passwords using Remove Desktop services. As soon as hackers get access to a targeted computer, they install a threat encrypting the victim's files. This ransomware family is known since March 2017. The BTCWare-PayDay ransomware should create the file !! RETURN FILES ! !.txt containing information about encryption and guidelines for victims, but the threat fails to do so. The threat only creates itself in the AppData folder as a .hta file and also drops two registry keys values launching it at the startup of the system. According to the warning, the user can have up to 3 files decrypted if the total size of the files does not exceed 1 MB. In addition, the files cannot contain any valuable information, which includes excel sheets, word documents, etc. Even if the attackers restore your files, you cannot be guaranteed that they will provide you with the decryption passwords or decryption tool after receiving your payment. Law enforcement and other entities fighting cyber crime recommends ignoring demands to pay ransom money. Ransomware creators have already earned significant sums of money by exploiting inexperienced computer users, and you should be one of those who does not become a statistic. Paying the ransom requested is likely to lead to a financial loss, so, instead of wasting your time, remove the BTCWare-PayDay ransomware as soon as you can. Regarding preventative measures of malware attacks, it is important to keep in mind that there are different methods of malware distribution. You should be aware of the fact that every form of data exchange while on the net can be employed to deliver malware to your PC. Software sharing websites, links in emails, email attachments, and non-updated software are just a few examples of how malware can be spread. Keep the OS updated and Remote Desktop Protocol disabled is worthwhile, because there are strains of ransomware that exploit system vulnerability and poor passwords of RDP. For example, the WannaCry ransomware exploited the vulnerability EternalBlue to infect over 200,000 computer round the globe. The BTCWare-PayDay ransomware is a part of a ransomware family that is spread after cracking poor Remote Desktop passwords. In addition to all these measures, it is also essential to keep the OS protected by a reputable security tool, because malware attacks computers stealthily without your consent or advanced notice. Removing the BTCWare-PayDay ransomware is also possible, and you can eliminate the unwanted threat with the help of the removal instructions provided below. Terminating the BTCWare-PayDay ransomware requires your accessing the Windows registry, which you do at your own risk. Bear in mind that the registry is a database storing low-level settings; however, a careless change in the registry may lead to some unwanted consequences requiring more time to fix the malfunction caused. After eliminating the BTCWare-PayDay ransomware from the computer, it is worth scanning the system to find out whether the system is in need malware-free. Use the shortcut Win+R to open the Run utility. Use the same Run commander to access Windows Registry by typing in regedit. Click OK.
Delete the values payday and baby after following the path HKEY_CURRENT_USER\SOFTWARE\Microsoft\Windows\CurrentVersion\Run. Quick & tested solution for BTCWare-PayDay Ransomware removal.